US Army’s Top secret? Projek Rahsia Tentera US?. Ia adalah suatu perkataan cliche yang bukan luarbiasa bila ada kena mengena dengan US. Mereka memang sentiasa mencari jalan meneroka perkara-perkara baru, atau teknologi-teknologi baru berkaitan dengan ketenteraan. Dulu ada projek Project Nutmeg, Project Aquiline, project 57, Project Kempster-Lacroix, Operation Argus dan banyak lagi. Mereka pernah mengadakan ujian membunuh biri-biri dengan renungan. Walaupun tiada bukti khusus yang dapat diperolehi tentang ujian tersebut tapi ia penah menjadi perdebatan satu ketika dahulu. Mereka pernah menggunakan manusia untuk ujian penggunaan topeng gas seawal perang dunia pertama. Manusia yang menjalani ujikaji itu di kurung dalam sebuah bilik dan mereka diberikan topeng gas yang kemudiannya di masukkan mustard gas ke dalam bilik itu. Apa itu mustard gas boleh cari pakai google. Klunya adalah ia sejenis sulfur yang jika di hidu boleh membunuh secara perlahan dalam tempoh 24 jam tanpa di sedari. Ia akan merosakkan tisu kulit dan menghancurkan paru-paru. Jika diikuti perkembangan projek rahsia tentera US ni, kita akan dapati mereka amat berminat dengan senjata biologi. Penggunaan gas sarin, salah satunya teknologi yang sentiasa tertutup rapat dan sering berlaku dalam peperangan pernah digunakan. Pada tahun 1953, CIA melalui Project MKULTRA telah menjalankan satu ujian untuk menghasilkan sejenis dadah dan agen biologi yang boleh digunakan untuk mengawal minda mangsa. Mereka yang berjaya dikawal mindanya akan mengikuti setiap arahan malahan melakukan mengikut perintah tanpa di sedari mangsa.Tapi tidak diketahui sejauh mana projek rahsia ini berjaya. It’s not every day the one has the opportunity to observe the construction of a secret underground base. This video is an actual declassified US Army film, documenting the nuclear-powered construction process of Camp Century, beneath the ice of central Greenland. The base was constructed in the late 1950s, during the height of the Cold War, for “research” purposes. 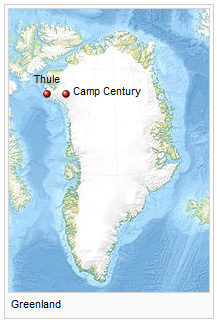 To study the feasibility of working under the ice, a “cover” project, known as Camp Century was launched in 1960. However, unsteady ice conditions within the ice sheet caused the project to be canceled in 1966. It eventually came out that the ultimate objective of Camp Century was of placing medium-range missiles under the ice – close enough to Moscow to strike targets within the Soviet Union. This was kept secret from the Danish government, which owns Greenland and which was legally a “nuclear free zone”, in keeping with Danish policy. Details of the missile base project were classified for decades, first coming to light in January 1997, when the Danish Foreign Policy Institute (DUPI) was asked by the Danish Parliament to research the history of nuclear weapons in Greenland during the Thulegate scandal. A report confirmed that the U.S. stockpiled nuclear weapons in Greenland until 1965, contradicting assurances by Danish foreign minister, Niels Helveg Petersen that the weapons were in Greenland’s airspace, but never on the ground. The DUPI report also revealed details of Project Iceworm, a hitherto secret United States Army plan to store up to 600 nuclear missiles under the Greenland ice cap. Danish workers involved in the clean-up operation claimed long-term health problems resulting from their exposure to the radiation. These were the words spoken to the European Parliament in 2007 by Diana Wallis, a British MEP. It sounds like a promising plot for an international blockbuster movie, but this largely forgotten piece of history not only had serious ramifications for the unfortunate workers commissioned to clean up the radioactive debris, but also uncovered clandestine nuclear activity on Danish soil, despite the nuclear-free zone peacetime policy announced by Denmark in 1957. Perched right at the top of the globe, Thule Air Base has been of enormous strategic importance to the US since its construction in the early 1950s. It’s an ideal location for radar to scan the skies for any stray incoming missiles. What the Danish populace did not know or need to know at the time was that, since 1961, nuclear-armed B-52 bombers had been continuously circling Thule Air Base on routine ‘hard head’ missions, as part of a cold war strategic missile warning system. Not only that, but around 50 nuclear weapons had also been stored at the base between 1958 and 1965. Project Iceworm was the code name for a top secret US Army program during the Cold War to build a network of mobile nuclear missile launch sites under the Greenland ice sheet. The ultimate objective of placing medium-range missiles under the ice – close enough to Moscow to strike targets within the Soviet Union – was kept secret from the Danish government. To study the feasibility of working under the ice, a highly publicized “cover” project, known as “Camp Century” was launched in 1960. However, unsteady ice conditions within the ice sheet caused the project to be canceled in 1966. Facts That Will Completely Change Your Perspective On The World.